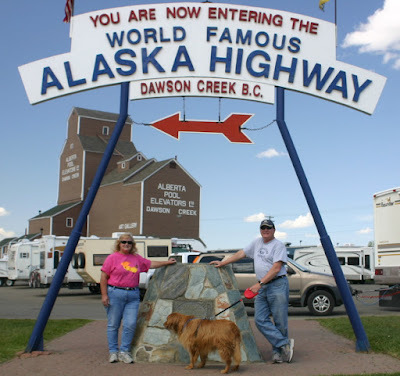 Where does the trip to Alaska really begin? Was it in San Jose when we started fulltiming? Was it in Muleshoe, Texas when we started heading west and north? Was it in Great Falls, Montana when we meet up with Fred & Jo Wishnie ? Was it when we crossed into Canada at the Montana and Alberta border? The trip probably really started many years ago when my ex-boss and friend Tom Dowd told me about his RV trip to Alaska and showed me his pictures. Regardless of when it started the official beginning of the Alaska Highway is Mile Post Zero here in Dawson Creek, British Columbian. This is so important that they have two official Mile Post Zeros. 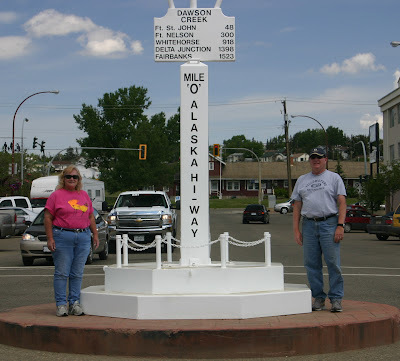 One is the current start of the highway and the other in downtown Dawson Creek is the original Mile Post Zero. We had driven from Jasper National Park to Grande Prairie, Alberta yesterday in intermittent rain showers but the closer we got to Grande Prairie the dryer and warmer it got (72 degrees). It was a short 80 mile trip to Dawson Creek today so we arrived at the RV Park at noon Alberta time or 11 AM Dawson Creek time. We got two of the last three spots available. I asked the RV Park manager, “you really are full at 11 AM?” He said “yes, it has been this way for weeks. We haven’t seen any fall off due to the price of gas”. Diesel is $5.43 per gallon and gas is $5.20 per gallon. 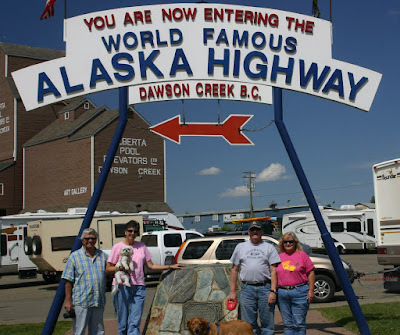 Everyone stops in Dawson Creek! This is the last “big” town until Whitehorse so everyone gets groceries, does laundry and gets their picture taken at Mile Post Zero. While walking Raider this morning I added two more birds to the year list: Black-capped Chickadee and Yellow-bellied Sapsucker. This brings the year list to 196. While driving over the many, many hills between Jasper and Grande Prairie we had 5 White-tail Deer run out in front of us. Fortunately, it was in an area with very wide clearings between the road and the forest edge. They were the first White-tail Deer we had seen this year. Rocky Mountain Big Horn sheep were up on the rocks overlooking the highway as we drove by. It was too dark and rainy to get that iconic shot, unfortunately!